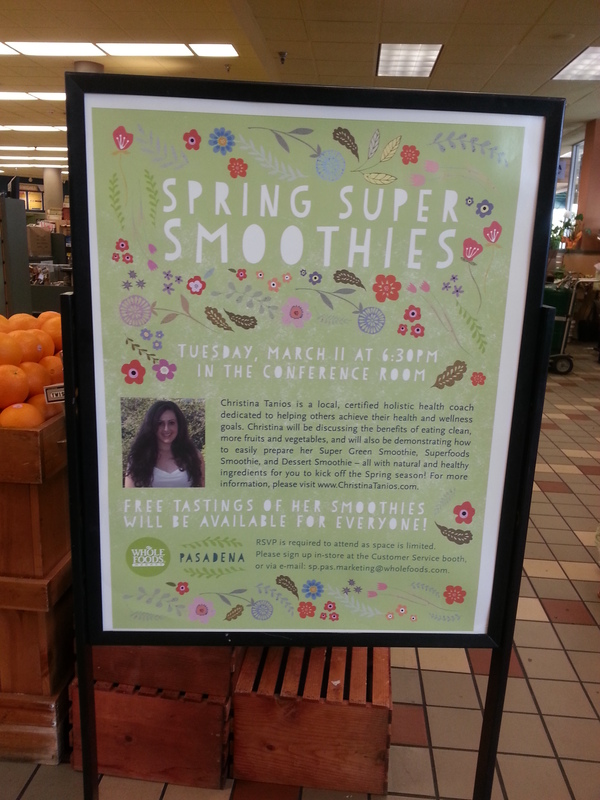 Last night I gave a health workshop at Whole Foods Market in Pasadena. The focus of the workshop was how to incorporate healthy, whole foods in our diet and I made three different smoothies for people to sample. I am so happy to say that the workshop went well; everyone working at Whole Foods was kind and supportive. The audience was a pleasure to speak with, and I was so excited when Jay, the marketing manager said that he had never seen a group of people so engaged during a workshop at Whole Foods! I love to have interactive workshops, so I was thrilled to have so many people asking questions and being fully present during the presentation. During the workshop, I made my Super Green Smoothie, Superfoods Smoothie, and Dessert Smoothie (which I also call my, “Tropical Island Smoothie” because it reminds me of being on vacation on a beautiful island :)). If you missed last night’s workshop, but would like to attend another one soon, I’ll be giving a health workshop at Whole Foods Market in Porter Ranch on March 25th at 6:00PM. I would love to see you all there!